Ethiopian music has been making the rounds in recent years in different forms. Bill Laswell's inclusion of Gigi with the group Tabla Beat Science was a sweet vocal addition to a somewhat technical electro-rhytm outfit. Gigi's sister Tigist Shibabaw joined up with Bole 2 Harlem for some of my favorite Afro-fusion dance music ever. And the continuing Ethiopiques series and Mulatu Astatke have given us many different flavors of Ethio pop, rock, and jazz. 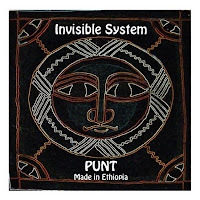 The creation of Dan Harper, who spent eight years working in Mali and Ethiopia (and worked on Dub Colossus' In A Town Called Addis), Invisible System brings another mutation step in Ethiopian musical evolution, with basic flavors familiar from these other albums blended with a variety of trance, dub, downbeat, rock, and electronic music. Fortunately, the additions never quite overshadow the great roots of the music, most distinctively the vocals and the fiddle lines. Start with "Because of You, I Faced So Many Challenges" and "Gondar" and then move on to the more transmogrified songs, and you'll discover a multifaceted album that ties together unseen musical threads. With a little less sameness among the tracks (and some editing of the indulgent extended guitar solo ironically answering the musical question posed by the song "What Have I Done Wrong"), this could have been a great album. Instead, it feels like an interesting evolutionary stepping stone on the road to something potentially much better. Stay tuned.